Sarthak Metals Limited is engaged into manufacturing of wide variety of Cored wires, Aluminum Flipping coils, Industrial Oxygen gas, having wide application in various industries including Steel plants, Fabrication units, and Foundries. The company is also a manufacturer and supplier of wire feeder machines that are known for drawing wires of 9 mm to 15 mm diameter. Sarthak Metals is also engaged in the business of trading of iron & steel and of carbon dioxide gas. The company forms the part of Desh Raj Bansal Group, Bhilai and commenced its operations in the year 1997 to manufacture industrial oxygen gas. Later in the year 2002, the company diversified its product base by manufacturing cored wires and aluminum flipping coils. Sarthak Metals also started manufacturing of wire feeder machines since 2012. 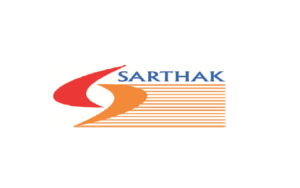 Sarthak Metals is headquartered in Bhilai, Chhattisgarh and currently has two manufacturing units located at Bhilai and Raipur, spread over an area of 1,23,560 sq.ft and 22,000 sq. ft (approximately) respectively, giving it competitive edge in the industry. Sarthak Metals IPO allotment status is now available on Bigshare Services Private Limited website. Click on this link to get allotment status. How many times total subcriptions ?